Greenwood’s Grocery & Catering has its roots in Farley, Iowa. The company originated when Eldon J. Greenwood, a veteran returning home from WWII in the mid 1940’s, purchased a small two aisle grocery store in his hometown of Farley, Iowa. Eldon Greenwood retired in 1980 and his children have maintained the food business and expanded the business to include catering & deli with lunch specials. We have available the finest cuts of beef and pork in a variety of sizes to fulfill your family’s needs. With the advent of the Internet, we have the opportunity to extend our tradition of providing “finer meats” to the surrounding area. 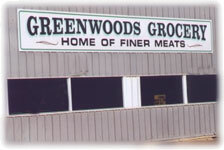 Greenwoods would like to invite you to our “Home of Finer Meats,” where the tradition of providing the customer with fine quality meats lives on!